← 2. Who am I? So our mantra will be GAURANGA NITAI-GAUR. All right, let’s practice saying that now. Everybody ready? We’re going to practice saying that. First I will say it and then you repeat. Like this. OK. Ready? All right, very good. At this point you may ask, “Well, exactly, what is a mantra?” Of course, a mantra is transcendental sound. But to be more specific, a mantra is made up of one or more of God’s names. The names of God describe God: the form, the characteristics, the activities. God is unlimited in all these categories. And therefore He has unlimited names. GAURANGA means He whose body is more beautiful than molten gold; describing the form of the Supreme Lord. NITAI means eternal. And GAUR means golden. From time to time the Supreme Lord appears in this world. And when He comes, He comes for our benefit. These appearances are known as incarnations. And very recently, only 500 years ago, the Supreme Lord appeared in a small town in India, known as Nabadwip. When He appeared, His bodily complexion was a beautiful golden color. Therefore He was known as Gauranga. 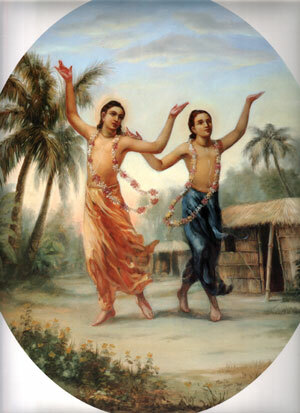 And He appeared along with His eternal associate Lord Nityananda. So in our mantra NITAI-GAUR this is referring to Lord Nityananda and Lord Gauranga. And they came specifically to bring to us mantra meditation. And they declared that this is the recommended process for spiritual realization in this age of Kali yuga. Maybe you have never heard of the Kali yuga. However we do know that in the material world there are periods of time. Seconds, minutes, hours, days, weeks, months. So on a very large scale there are long, long periods of time. And these are known as yugas. There are four yugas which are continuously rotating in a cycle. Just like the four seasons of the year rotate in a cycle. The first yuga is the Satya yuga. It lasts a very long time. People live very long lives. Opulence is present everywhere. People are very spiritually advanced. So materially, this is as good as it ever gets. This is followed by the Treta yuga. This is the silver age. The Satya yuga is the golden age, and Treta yuga is the silver age. And the Treta yuga is shorter. People’s lives are shorter. It’s not quite as perfect. And then comes the Dvapara yuga, the copper age. It’s, again, shorter and less perfect. And then finally comes the Kali yuga. And this is the age we’re living in now. The Kali yuga is known as the iron age. For two reasons. Number one, iron is the most prevalent metal. And number two, the hearts of people in the Kali yuga are like iron. There’s very little mercy, there’s very little compassion, there’s very little love in the Kali yuga. This is also known as the age of quarrel, chaos and confusion. So if we look at the world today, whether we look on a personal level, national level or international level, everywhere we find quarrel, chaos and confusion. Very difficult age. However there’s one good thing about the Kali yuga. When the age is the most difficult, the process for spiritual realization is the easiest. So into this difficult age of Kali yuga Lord Gauranga came. And He brought to us mantra meditation. He practiced it Himself and He taught millions of others. That is why we are practicing it ourselves and also teaching others. In reality, most people don’t come to meditation for a spiritual reason. People are interested in meditation because they want freedom from stress, freedom from anxiety, peace of mind. So if that is your interest, then these meditations will address those issues. So it works on the physical level, the mental level and the spiritual level all simultaneously. OK, once again, our manta is: GAURANGA NITAI-GAUR. The method is very easy. First we breath in through the nose, slowly and gently, but very deeply. We want to take the air all the way down to the lower abdomen. When our body’s filled with air, we begin to exhale. And on the outgoing breath out loud we will chant GAU-RA-ANG-GA. Then we inhale again, slowly, gently and deeply. And on the next outgoing breath we chant NI-TAI-GAUR. And then we repeat it several times. Before we begin the meditation, we want to relax. Relaxation is very important. But, unfortunately, we almost never do that. You may say, “Oh, I don’t know how to relax!” Or, “I don’t have time to relax.” And if we do decide to relax, often we use alcohol, drugs, something like this. Not good. Kali yuga’s filled with tension. That accumulates in our bodies, especially in the upper body. One main area is the face. We carry so much tension in the face. That’s why we get wrinkles very early in life and then spend the rest of our life trying to get rid of them. So relax the face, consciously relax it. Another area is the neck. We even get tension headaches right from the neck. So, again, relax the neck. Another area is the shoulders, chest. There’s even a saying, “Don’t be so uptight!” We then say “I’m not uptight!” Relax. To help us relax, we’re going to take a big breath and let it out. And with the outgoing breath goes the tension, the anxiety, the frustration. Then while we do the meditation, we want to listen very closely to the sound. Think of it as there’s friend telling you a special secret. You listen, you don’t want to miss anything. And secondly, put the mind on the sound. The mind will drift away to another subject. Bring it back to the sound. It drifts away again. Bring it back to the sound. Like a mother with the two-year old kid. She puts the kid down, he goes off. She brings him back. He goes off. She brings him back. Our mind is like that kid. But remember we are not the mind. Remember? We’re spirit soul. So we bring the mind back to the sound. OK, I’ll give you a little demonstration and show you exactly how it works. Then we can all do it together. We do encourage everyone to participate. Meditation is not a spectator sport. I didn’t come here tonight to meditate and you guys watch, “Look at that guy!” No, we’re all going to do it together. And the more we all take part, the more we all benefit. So you can experience the meditation. I know for some of you this is very unusual, you’ve never done anything like that. But that’s all right, relax and do the meditation. OK, it’s just that easy. Let’s all do that together. It’s good to sit erect in the seat. This helps us to breathe. Feet flat on the floor is the best. OK, so remember to relax, meditate on the sound. Try to get the feeling the sound is surrounding you completely. And also that the sound is flowing through you. You’re not the source of the sound, the sound is flowing through you. And then when we’ve finished, just sit there quietly for a couple of moments and feel the effect.